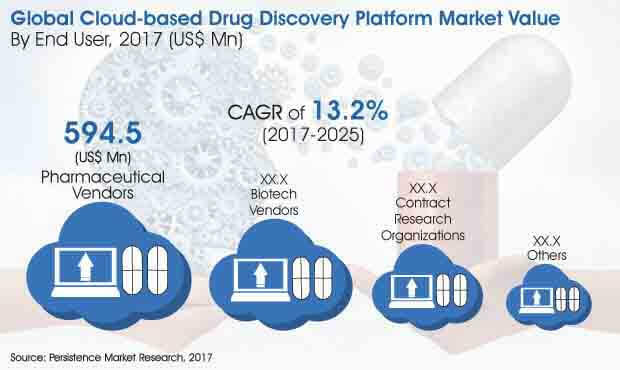 Among the various end users of cloud-based drug discovery platforms, pharmaceutical vendors are likely to be major stakeholders holding a high value share of the global cloud-based drug discovery platform market. An opportunity analysis of the global market reveals that leading software vendors have already adopted cloud-based drug discovery platforms to facilitate seamless research and development processes. As there is less adoption of these cloud-based platforms in several countries of the MEA, public and private ventures are taking initiatives to invest in the R&D process in this region. Moreover, the MEA cloud-based drug discovery platform revolution will witness significant growth in the coming years, thereby creating better opportunities for software vendors for growth and expansion. Our forecasts indicate that the Pharmaceutical Vendors segment will remain the leading end user segment during the forecast period 2017 to 2025, estimated to reach a market valuation of US$ 1,625.0 Mn by the end of the forecast period in 2025, with a CAGR of 13.4%. In terms of CAGR though, the Contract Research Organizations segment is expected to stand first, registering a growth rate of 13.8% during the eight year period. The Contract Research Organizations segment is also anticipated to witness high Y-o-Y growth rates throughout the forecast period. North America: Pharmaceutical and biotech vendors in North America are focusing on boosting their drug development process using cloud platforms, without compromising safety. Easy availability and accessibility of cloud platforms enable enterprises to collect real-time data around the world. Such platforms also provide better access to data from healthcare companies as well as contract research organizations during the R&D process. Latin America: Most of the life sciences companies in this region are adopting cloud computing services for managing their increased data traffic, with minimized IT infrastructure costs. Massive implementation of software-as-as-service by healthcare organizations enables them to efficiently store and retrieve patient data, health records, and R&D records. Moreover, SaaS helps healthcare companies in collaborating with different vendors and contract based research organizations located across the world. Europe: European pharmaceutical companies are increasingly turning towards the adoption of cloud-based technologies to support their scientists and their work, along with the research mutations in the human genome for improving the cancer research drug discovery process. Scientists are targeting more areas of medication design that are beneficial for patients. Moreover, healthcare companies in Europe are implementing advanced cloud technologies such as machine learning and artificial intelligence platforms to gain optimized R&D outcomes. AI algorithms are being used to design bi-specific drugs that can be used simultaneously to bind more than one target. This platform has the ability to improve complex biological problems and help enterprises in enhancing the efficiency of their drug discovery optimization. Asia Pacific: Life sciences companies in the APAC region are adopting clinical cloud platforms to introduce innovative technologies with improved operational efficiency, productivity, and enhanced speed of clinical trials. Clinical cloud platforms offer better services and inject new vigor in the drug development process. Additionally, clinical cloud platforms help life sciences companies accelerate the delivery of their novel therapies to patients. Life sciences companies are looking for innovative, cloud-based research solutions to cater to the basic needs of their scientific workforce, which is increasingly relying on mobile communication and social networking to gain improved work productivity. Cloud based mobile-enabled information management helps researchers with improved and efficient data and knowledge sharing. Easy integration of on-premise systems with bi-directional cloud can help life sciences companies safely switch their critical legacy applications to the cloud. MEA: Healthcare companies in the MEA are transforming their IT infrastructure to the cloud, as the increasing usage of cloud platforms and mobile devices enable healthcare institutions to track patient health across various devices, which provides valuable insights for R&D activities. Digital transformation operations in the MEA region are mostly funded by government bodies and private institutions.